The Acadian Museum of Erath, LA, is a 501(c)(3) non-profit corporation. All revenue from the sale of the items from the museum boutique listed on these webpages supports the Acadian Museum activities, including its educational programming, "Living Legends" series, and maintain the building that houses the museum. We thank you for your generous patronage. Need help ordering? Click here for simple instructions. Poster designed by Architect Andrew Perrin depicting Beausoleil arriving with the Acadians in New Orleans during the winter of 1765. The poster measures 18x24. Signed by the artist and suitable for framing. Note: For international orders, please contact us. Book boasts more than 200 vintage and modern images chronicling the growth and change of this Louisiana parish. Limited edition (signed by former Gov. Edwards) hand-drawn poster by Andrew E. Perrin depicts former Governor Edward Edwards' induction into the Order of Living Legends by the Acadian Museum on August 4, 2012. The poster measures 11x14. 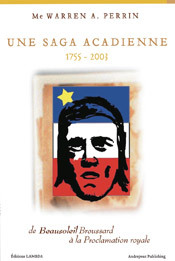 Acadian Redemption, the first biography of an Acadian exile, defines the 18th century of Acadia into which Joseph Beausoleil Brousssard was born in 1702. Find out more about the book and what people are saying about it. Une Saga acadienne, est une véritable histoire marquée par la persécution, l'exil, la ter- reur, le courage, l'espoir et le triomphe. Une rétrospective rafraîchissante et unique des événements qui ont formé la culture cadienne en Louisiane. A beautiful 300-page hardcover book containing over 100 vintage photographs and maps that should be a part of everyone’s library. Since the Deportation of the Acadians in 1755, traces of the once thriving settlements have been rapidly disappearing. In some cases entire village sites have been forgotten and their locations ignored. The foundations of Acadia is an attempt to relocate some of these lost villages in the Hants County area and to document what remains. 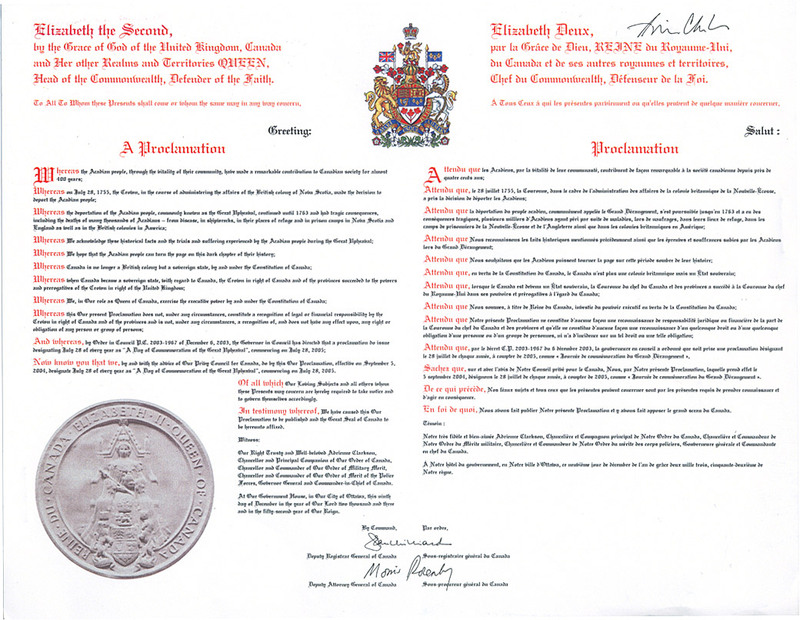 Bilingual proclamation by Queen Elizabeth the Second, suitable for framing. 8.5 in. x 11 in. White, 100% Cotton with book cover art on front and map on back. Available in Large size only. Package includes pin and two coupons - one for $1 off admission to the Zoo of Acadiana in Broussard, LA and another for one free lunch or dinner buffet at Grand Casino Coushatta’s Marketplace Buffet.